16 Point Star on the Bottom like Waterford with a Diamond Palm Spike Design, 6 Sided Stem that Stands 6 3/4" Tall and holds 6 ounces to Rim. SET OF 10 MULTI FACETED CRYSTAL WINE GLASSES. Beautiful Old Fashioned Crystal will be a Great Addition to Your Next Party or Family Gathering! This listing is for an elegant set of 12 Italian Crystal Wine Glasses with gold trim. These glasses were made by Cristal 3A. Original packaging included. Approximately 4 1/2" tall. Pattern: Sutton Place by Godinger. Each ice tea glass is marked with Shannon on the bottom. Status: Discontinued. New Listing2 Edinburgh Crystal Thistle Cut Champagne Flutes, Mint! 'Gorham' marked to base. Set Of 11 wine glasses fromGorham the beautifulLADY ANNE pattern. Gorgeous criss cross and vertical cut bowl on a panel cut stem. All are clean, clear and glossy. Excellent with light wear only. These glasses are new in the box. There are 2 sets of glasses with 4 glasses in each box. They still have the sticker on them & the order forms. Vintage Etched Flowers Crystal Wine Goblets/Stems Set of 4 Napkins not included. New Listing1 Edinburgh Crystal Thistle Cut Champagne Flute, Excellent! Kylemore (Criss Cross Pattern Cut). Galway Crystal. Water Goblets. Two of the goblets still have original sticker on side. Up for Sale for Your Viewing Pleasure. If washable or wipeable, I will do so. SCHOTT ZWIESEL Set (6) Wine Goblets Glasses Germany New In Box. There are no chips or cracks. I am also selling champagne flutes and burgundy glasses in separate listings. New Tiffany & Co. Classic Crystal Champagne Glasses. Pair of 2. 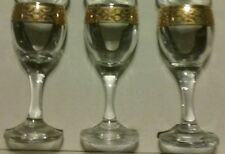 UP FOR SALE IS A LOT OF 4 CRYSTAL WATER OR WINE GLASSES THAT WERE MADE BY TOWLE. THEY ARE UNUSED AND HAVE THE ORIGINAL LABELS ON THEM. THEY JUST NEED A GOOD CLEANING FROM BEING IN STORAGE. WHAT A GREAT FIND. BOHEMIA CUT CRYSTAL "BELFAST" pattern. TEN (10)champagne included for one money! BLOCK Crystal Large Double Old Fashioned Glass, "Sunrise", 3 7/8"
This is a heavy, crystal glass (weighing over 1.9 punds!). Set of three new Noritake wine goblets in the Turning Point pattern. They are a little bit taller than 7 1/2”. One has the original sticker. 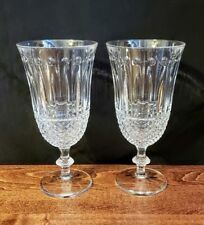 Set of 2 Schott Zwiesel Crystal water / wine glasses in Tango pattern. THIS SET CONTAINS (5) ROGASKA CRYSTAL WATER GOBLETS IN THE "SOHO" PATTERN. THE PATTERN WAS PRODUCED BETWEEN 1989-2010. BEAUTIFUL HIGH-END "ROGASKA" CRYSTAL. WATER GOBLET GLASSES! We are easy to work with, but will be firm and fair. Set of two (2)Kusak clear plain 3 3/4" champagne glasses with a multi-wafer stem. Glasses are in excellent gently used condition. THIS IS A SET (2) OF 11" LEAD CRYSTAL CANDLESTICKS WITH A NINE SIDED BASE THEY HAVE BEEN IN A BOX FOR ABOUT 30 YEARS. (2) GALWAY Crystal "Kings Court" Champagne Flutes, 8 1/4"
May have a light surface scuff or two consistent with very gently used crystal. SET CRYSTAL WHEEL CUT ETCHED GLASSES. GLASSES ARE 6" TALL, 3 1/2" OPEN MOUTH, ETCHED. HEAVY FLORAL AND VINE DECORATION WITH IN-SIDE OPTIC PANEL. VINE DESIGN BASE 3" DIAM. ALSO HAVE OTHER MATCHING WINE/COCKTAIL SET AND SET PARFAIT/TEA. Set Four Crystal High Ball Glasses made in Germany- NEW w/Box ! Had been a gift a while back. New as I opened box to be able to take picture. MINT condition. Lovely delicate stemware. In great shape! Stunning and collectible Gorham Bamberg Water Goblet or Water Glass. Multiple available. A matching set of 2 elegant fine-cut crystal glass champagne toasting flutes, complete with original stickers, made by Rogaska. This is for 1 set of 2 glasses, however there are a total of 3 matching sets available. Noritake Moondust. Crystal Champagne Flutes Set of 4. Full Lead Crystal - Made in West Germany. I tried to get a picture of the etched design. but I just couldn't get it. The design is there. (Mon.-Fri.). SIX (6) Bachmann Bleikristall Wasserk PATRIZIA CHAMPAGNE GLASSES. Tear Drop Design, Multi-sided Stems with a mid way knob. Box is still Good with a sepated interior flap or two. 24% Leaded Crystal Marked on Box Label. CONDITION : Previously owned, light wear. Stunning set of 4 cut crystal Royal Doulton Wellesley Gold white wine glasses. Pl ease view photos carefully. Pre-owned but in flaw-free condition. For your consideration is a set of (4) Schott Zwiesel crystal cordial glasses in the “President” pattern. The glasses stand 5 1/8” tall and have the Zwiesel logo on the base of each glass. These glasses have been discontinued by the manufacturer. Very minor interior surface scratches. Fantastic sparkle! I understand this pattern has been discontinued. This beauty will grace any table! A thousand uses for a beautiful pristine very fine crystal biscuit barrel whose exquisite diamond pattern scatters light in all directions. Ice bucket in the bar. The entire piece weighs in at 4 lb & 6.8 oz. Shannon Crystal Ship Sculpture IN ORIGINAL BOX 6" X 5 1/2"
Set Of 24 Black Crystal Glasses. Condition is used like new. Three different sizes, set comes with 8 of each size. Shipped with USPS Priority Mail. Atlantis Crystal -Old Fashioned Glasses. Hard to Find -Never Used set of 4.